WASHINGTON — The terrain was tricky, the bugs were out, and the heat from the sun was growing more intense by the minute — but Drew Adams was determined to find mushrooms. After about 20 minutes of hiking along the Potomac River, he spotted a patch. “How cool is that?” Adams said, pointing to crown-tipped coral mushrooms growing on the side of a log. As the executive chef for Bourbon Steak — one of D.C.’s most prestigious restaurants, located inside The Four Seasons — Adams is responsible for keeping items on the menu fresh and seasonal. And when he needs inspiration for new dishes, he looks to the forest. Once dry, he said the berries are best ground and used in rubs to season meat. The stems add flavor to fire, making them a valuable accessory for grilling or smoking. Adams, a Baltimore native, has been foraging for about six years, and in that time he has noticed other chefs embrace the activity of collecting provisions from local fields and forests. “People are searching for new ways to do new cool things and have the next new cool thing, so I think that a lot of people are paying a lot more attention to it now,” he said. Depending on the season, foragers in the D.C. area can find everything from wild mint and stinging nettles, to ramps and mustard greens. Pawpaws, a tropical-like fruit that’s a cross between a mango and a banana, also grow plentiful in the region, as do persimmons and sorrel. There are a few guidelines when it comes to foraging. First, it’s important to study up on what is and isn’t edible, and to go with someone who knows what they’re doing. Second, check the regulations in place for parks and public land; fines are often issued to rule-breakers. While Adams can’t plate the nuts and produce he finds in the forest for diners at Bourbon Steak, foraged foods shape the orders he places for the restaurant. He is currently working on a dish to showcase chanterelles, a brightly hued mushroom that’s easy to find in the D.C. area. Making pawpaw ice cream is another way he brings outdoor ingredients into the kitchen. 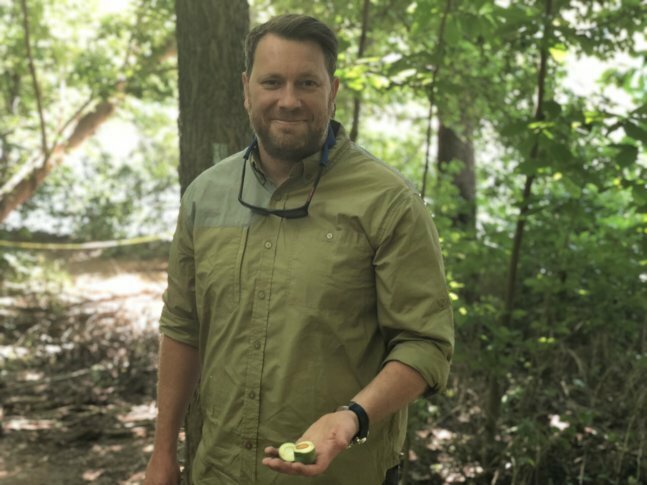 This summer, Adams is sharing his passion with others through his “Foraging and Feasting” excursions. Saturday mornings, he’ll lead groups on three-hour foraging walks and teach participants about the region’s edible plants and produce. Afterward, the group will return to Bourbon Steak for a five-course meal inspired by the day’s finds. “You just start noticing things a lot more [once you learn to forage],” Adams said. The Feasting and Foraging experience is $615; reservations can be made by emailing BourbonSteak.WAS@fourseasons.com.